Skyline Suncoast Displays is West Central Florida's source for all your trade show and event needs. Skyline Suncoast Displays & Graphics is a full-service trade show, exhibit, event, and graphic design company offering I & D throughout the United States and worldwide. We have been servicing Western Florida, the suncoast, for over 25 years. As the dealer for Skyline we are able to provide you local expertise combined with a global network. We are more than just hardware. We are trade show savvy, visual marketing professionals. We have a passion for creating trade show exhibits that are unique and memorable. Our strategic objective is to use our many years of experience to design and produce an exhibit for your company that is a “show-stopper”. 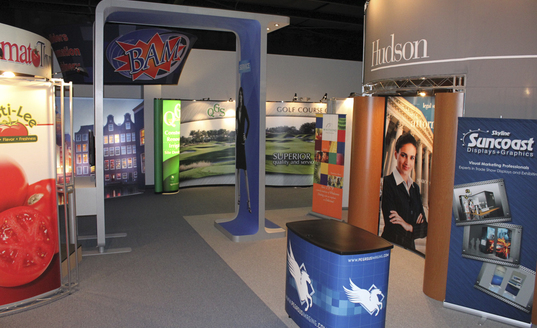 Stop your consumers in the aisles and draw them into your exhibit space! Skyline Suncoast has a variety of exhibit systems that are compatible to create nearly any look -- and meet any function -- imaginable. Skyline exhibit systems are structural to support AV equipment and product.